Indonesian villagers are claiming they have caught a python which is almost 15 metres (49 feet) long, according to local media reports. If confirmed, it would be the longest snake ever held in captivity. It is currently being kept in a zoo in the village of Curugsewu on the island of Java. 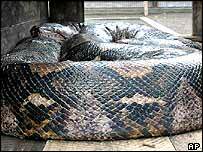 Reports said that the snake was purchased from a man who caught it in a Sumatra forest last year. Newspapers quoted a local official as saying the python was 14.85 metres long and weighed 447 kilograms. They said that the snake had only recently been put on public display and ate three or four dogs a month. Following the claims, Reuters news agency subsequently reported that the snake did not measure up and was not of record-breaking length. Officially, the longest snake ever caught was a python shot in Celebes in Indonesia in 1912, which was almost 10 metres in length. "The snake had been revered as a leader of the Kubu tribe"